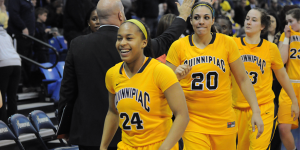 In its final season as a member of the Northeast Conference, the Quinnipiac women’s basketball team looks to leave its mark and finish on top. Today, the team got one step closer to doing so. For the third time this season, No. 1 Quinnipiac dominated No. 8 Bryant by a final score of 79-55. Just like the first two wins, the Bobcats victory came by double digits, something they have grown accustomed to this season. No. 1 Quinnipiac will host No. 6 Mount St. Mary’s on Wednesday at 7 p.m. at the TD Bank Sports Center in the NEC semifinals. In its last 10 games, nine of Quinnipiac’s victories have come by at least 10 points and only twice did an in conference opponent finish within 10 points of the Bobcats in their 18 game conference schedule. The Bobcats made a double digit margin look easy today and they reached that gap before the first media timeout. After allowing Bulldog leading scorer Naana Ankoma-Mensa to score the games first basket, Quinnipiac (28-2, 18-0 NEC) went on a 14-0 run which would give them more than enough separation for the rest of the game. The Bobcats headed into the break with an 18 point lead after forcing 15 first half turnovers, resulting in 19 points. Quinnipiac would finish the game with 27 forced turnovers. Quinnipiac’s defense was also running on all cyclinders as the team finished with 18 steals, eight of which came from guard Gillian Abshire. Barron, the NEC Defensive Player of the Year finished with a tie for the lead for points for Quinnipiac with 13 and also chipped in two steals. Forward Samantha Guastella also had 13 points for the Bobcats off of 4 of 10 shooting. Brittany McQuain continued her season dominance down low with a double-double of 11 point and 16 rebounds including eight on the offensive glass. Quinnipiac outrebounded Bryant (12-18, 8-10 NEC) 47-39 and its 22 offensive rebounds resulted in 16 second chance points. “I thought we did a heck of a job rebounding the ball today and that’s always led to a lot of offensive possessions,” the NEC Coach of the Year said. While the usual forces had good games for the Bobcats, the team produced one of its best team efforts of the season with all 10 players in the lineup scoring at least three points. Coach addressed that Maria Napolitano was sick with the flu which gave fellow freshman Kaite Carroll a chance to see postseason minutes. Carroll thrived in the opportunity going 3-for-4 from the line as well as picking up three assists. Senior guard Lisa Lebak also played smart with four assists and zero turnovers. She hit her only shot she took, a 3-pointer from the top of the key to extend the lead to 22 points with 8:15 remaining in the second half. While it was a great team effort, Fabbri noted that the one thing they must improve on is shooting as the Bobcats missed nearly 50 shots on the day going 28 of 77 from the floor. The past two seasons, Monmouth has ended Quinnipiac’s season in the NEC Tournament. This year, that’s impossible as Mount St. Mary’s did the Bobcats a favor and got its first tournament win in 12 years by beating them in overtime, 59-57.